For those unfamiliar with GURPS, it's a point-buy system rather than randomly rolled, class-and-level, or life path, and pretty much everything in play boils down to "try to roll a target number or less on 3d6," with various ways of figuring out how to get to that target number. GURPS is one of a number of "universal" games which came out in the 80s, and it gained a following for being comprehensive in scope, well edited, and, for books with scientific or historical content, highly accurate and informative. It's in its fourth edition now, so it's refined and very stable. 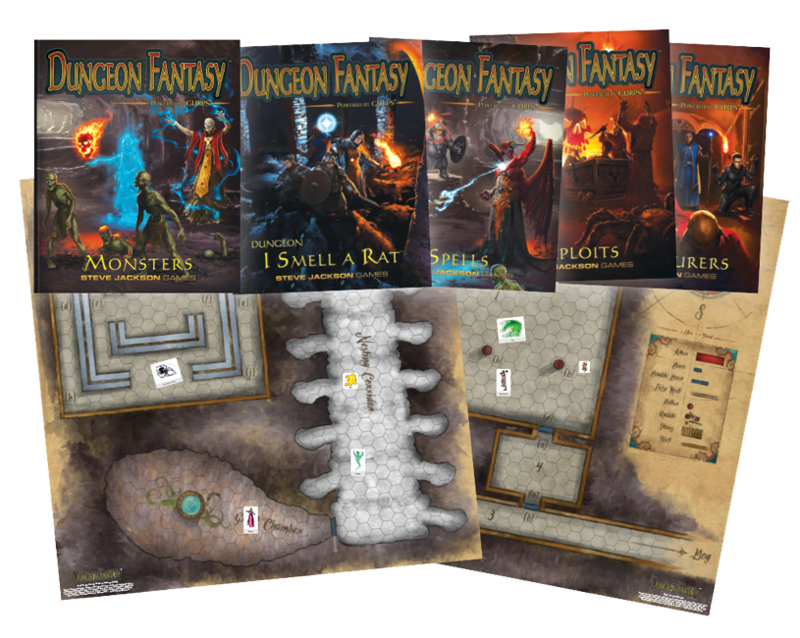 The DFRPG is a stripped-down version of that, an implementation focused on dungeon-crawl fantasy gaming. GURPS tends to have some front-loaded complexity involved, but this cuts through at lot of that, letting you get to actual play, which is usually pretty smooth, quickly, and it doesn't miss a single opportunity to provide useful advice and convenient references to keep the action moving. It keeps a lot of the flexibility and useful detail, but strips out a lot you don't need for a fantasy game. The one box contains a complete fantasy RPG, requiring no books from the orthodox GURPS line. Rules not directly relevant for adventuring in pseudo-historical drag. No TLs or equipment from after the Industrial Revolution. I've said elsewhere that DF is set in TL Olden Times, and this set continues to embrace that. It's a pulp fantasy/video game comprehension of technology, not bothering to make much of a distinction between, say, Classical, Medieval, and Renaissance technologies. Rules not directly relevant for dungeon and wilderness adventures. It does retain a core of rules for social interaction (influence skills, reaction rolls) so adventurers still have a framework for negotiating with merchants in town and demon princes in the dungeons, but don't expect the level of support that you'd find in, say, GURPS Social Engineering. Fiddly customization systems. Orthodox GURPS provides vast scope for fine-tuning abilities, like adding enhancements and limitations to advantages and disadvantages or techniques to skills, or the Affliction and Innate Attack advantages, which essentially frameworks for abilities rather than abilities themselves. Those are dispensed with here. There are a number of profession-related abilities which, if you were to look under the hood, would be revealed as the products of those systems, but here it's just "Here are some abilities; now go do something with them." A setting. Sort of. There are a number of tropes in play. Good and evil objectively exist and can be detected in certain kinds of entities (though usually not humans and other such mundane persons). There are horrific Things From Beyond Time And Space, distinct from the Devil and his minions, and nature has a power of its own (it's a common joke in DF that there are four moral orientations: good, evil, bunny, and squid). Clerics worship gods who grant them their powers. A mysterious East from which martial artists derive is suggested though not required. There are kings running the show in civilized areas through their enforcers, though there's a lot of dangerous territory outside of their jurisdiction. However, no specific kings, empires of the east, demon lords, or anything like that are mentioned. The game tells you what kind of place it is without giving you a specific place. That, you still make up yourself. And one of the lovely things about this, at least for people like me, is that it's still GURPS. The box set stands by itself and requires nothing else to play, but it is nevertheless 95+% compatible with the rest of GURPS. Want more treasures? Just pick up the GURPS Dungeon Fantasy 8:Treasure Tables PDF. Want more detailed and finely tuned combat abilities? GURPS Martial Arts will let you layer techniques and styles on top of existing skills. Want to roll your own Expedition to Barrier Peaks? Nothing's stopping you from tossing in stuff from GURPS Ultra-Tech. But you won't need to. If you want to, you can begin and end with the box set and have a perfectly good time.